The most challenging aspect of starting to invest is picking the first few stocks to add to a portfolio. Every investor has their own techniques and strategies, but we want to give you the tools you need to place your first trades, and get your portfolio off to a running start. Before choosing your first stock, the first step is deciding what your goals are for your portfolio. The biggest choice you will make will be balancing risk and reward – investing all your cash in very risky assets with high growth (or loss) potential, or focus on companies that you believe can be strong in the long run. In order to reduce some risk in picking stocks, you might want to try using a professional. This Motley Fool Review will explain how the Motley Fool team analyzes stocks to find what they believe are the best stocks to buy. If you want a more thorough review of their best selling newsletter then our Motley Fool Stock Advisor Review will tell you about their most popular advisory service, how it has performed in the last 3 years, and give you a 50% discount if you want to try it. If you still aren’t convinced, then read this review of the top stock newsletters. Once you consider how risky you are feeling, next decide how you want to diversify your portfolio, which will help you decide how much cash to invest in each symbol. Your challenge may do this automatically – most challenges include a “position limit”, meaning you can only invest a certain percentage of your cash in any single stock. You can check if your contest has a Position Limit rule on the Account Balances page. Once you establish the minimum number of securities you need, you can now start handpicking stock symbols by using a trading strategy. You can also create a mix of these strategies to get the best of each strategy. Your goal with your Trading Strategy is to get a list of stocks or ETFs that you might want to invest in. The purpose is just to get a “wish list” of stocks – at the end of the day, you will probably add half (or fewer) of your initial picks to your permanent portfolio. Once we get that initial list of possibilities, we will take a look at how to narrow the list down. The best way to start when buying stocks is to buy what you know, not trying to follow stock tips or read a bunch of technical analysis that you cannot follow. Think of it this way: if you already know a company, they have done well enough in the past to already become a household name today. This gives you, as the investor, a big advantage; you can see how that company is doing just by looking at their stores and reading normal business news. Have they started to open new stores around me lately, or are they closing some shops? Does there seem to always be a lot of people you know using their products, or are they still more obscure? Does their current news look positive or negative? If all three of these are positive, then this might be a good place to invest. An investor can always handpick stocks based on the earnings calendar. To do so, you would have to know your investment time horizons, and flip through the earnings calendar to find gems (i.e. stocks that you can buy and that will soar during its earning season, or stocks that will tank and that can be shorted beforehand). The Earning Strategy is somewhat of an evolution of the “Invest in what you know” strategy – you will be looking for companies that you believe will have high earnings announcements coming up soon, which can cause their stock price to rise. Once you have found your stocks, it is very important to analyze them and back-up your assumption of how the market will react to their earnings report. 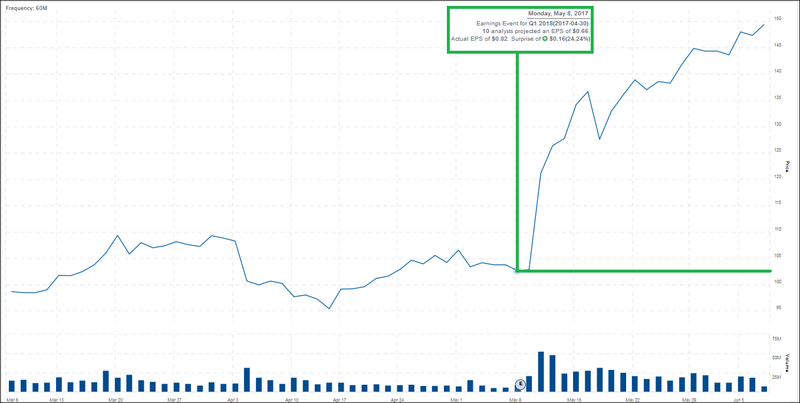 An example of a well executed trade based on the earnings’ expectations would be Nvidia (NVDA). Before the presentation, NVDA was trading around 102 and soared continuously every since to 149.44 on the 7th of June 2017! You can compare with other stocks with recently-released earnings using our Quotes Tool. If you are not sure which specific stock to select, you can always invest in ETFs and market indices. These products are already diversified for you and will track a specific market for you. As an example, let’s say you want to invest in a gaming company, but don’t know which company in specific. You can always invest in an ETF that will track the gaming market for you. In this situation, you can invest in the PureFunds Video Game Tech ETF (GAMR), which tracks this market for you. Based on their website, they have invested in gaming software firms such as Ubisoft, Activision, Konami, etc., which means the stock picking and allocation tasks has been already taken care of by the Fund Managers of this ETF. You can find a specific ETF here. Many investors also start with a passive strategy, and slowly break out. This would mean starting your portfolio by picking ETFs in 5 industries you want to invest in, then looking at each of those industries in detail using some of the other strategies here. Once you identify some stocks within those industries, you can sell off some of the ETF holding, and use the cash to invest in the stocks you have researched. You can also use stock screeners to find good purchases and short sales. A Stock Screener is a program or website that will ask you some questions about what you are looking for in a stock, and return a list of stocks that match your criteria. You can then do extra research on these stocks to determine if they should be added to your portfolio. One of the best stock screeners is Chaikin Analytics, which offers free 90 day usage for beginners (but the free period expires after that). Check it out here. This page is very useful for the start of your research. It presents the day’s market summary. It is useful because it tells you how the overall market is doing today. As an example, on May 17th, 2017, you would notice that indices such as SPY dropped 5 points due to the “Trump-Russia” investigation. This can be used as a signal to certain investors to buy more. If an investor purchased SPY during the dip, he/she would have gained more than $5 per share! It is always important to review how the overall market is doing and the market news today. This can help you to capture the perfect timing to buy stocks at their lowest price (or to short sale them at their peak). This page presents stocks’ quarterly earnings pre-announcements with the current estimate and new range. A stock’s volatility increases when it is near the earnings report. The Analyst Ratings page presents the recommendations given by brokerage firms and financial analysts. This page will be useful to analyze a stock’s recommendation trend and the current average recommendation. Looking for an ETF? This page is a great place to see what ETF is currently doing well and what ETF is not well performing. These ETF can signal current market trends and help you make choices based on that. Wondering what other users are trading? This page presents our popular stocks and mutual funds. We also present top gainers and losers and hot stories that is moving the market today. 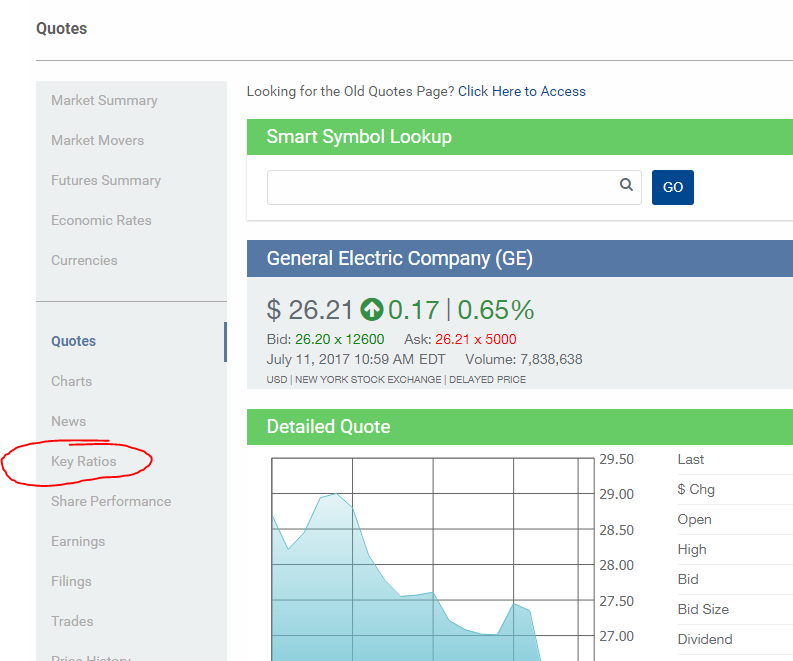 You can also find our random stock generator, which generates 3 random stock ideas! The Upgrade/Downgrade page presents all the changes in analysts’ recommendation of symbols. You will verify if these stocks are truly good investments. They can be rejected if you discover that they are in fact not good investments. You will back up your assumptions about these stocks. If your Investors, Professor or Classmates has any questions about the reasoning behind your stock picks, you will be able to elaborate a robust and solid argument. This is where you can pick the stocks that actually go into your portfolio for the long-run. If you started with a Passive strategy, your portfolio might already have some industry ETFs, but now we will be looking at specific companies to replace part of those investments. We will explore a couple of basic research methods that will complement your findings on your stock picks. Technical analysis is the process of determining patterns and trends with the use of historical data for a security and charts of a specific timeframe. Charts are clearly an efficient way to visually notice a pattern and act upon a specific trend. We will visit a couple of basic chart patterns and put them in real-life situation context as well. Most of the technical analysis tools make use of the charts you can find in the Quotes Tool. A trendline is a straight line that connects the stock’s price movement together and creates an upward or downward pattern. It is often recommended to connect more than 2 points to have a stronger trend line. Trendlines are useful to give you a general idea of how the stock’s price is generally moving. A positive trendline does not mean it will keep going up forever, but can be an indication that there are some strong underlying business foundations. A support line represents a price level at which the stock never went below. In other words, it is the point at which the stock struggles to go under. On the other side, a resistance line represents the price level for which the stock cannot breakthrough. Stocks near their Support lines tend to rebound, so they might make a good investment (at least in the short term). Stocks near their resistance line tend to fall back down, so they might signal a shorting opportunity. When a stock breaks through their support or resistance lines, it is called a “Breakout”. This pattern consists of two trend lines which are symmetrical to the horizontal and are convergent. To prove a symmetrical triangle, one must have oscillation between the two lines. A triangle pattern indicates that the price is about to move – but a symmetrical triangle does not give a clear indication that the price will go up or down. The Ascending Triangle pattern refers to two converging trend lines. The first line is an upward slant which is the support and the other is a horizontal resistance line. To validate the ascending triangle, there must be an oscillation between the two lines. This triangle implies a bullish continuation pattern. The Descending Triangle pattern refers to two converging trend lines. The first line is an downward slant which is the support and the other is a horizontal resistance line. To validate the ascending triangle, there must be an oscillation between the two lines. This triangle implies a bearish continuation pattern. Fundamental analysis is the process of examining the fundamental aspects of a firm. It involves reviewing key ratios and sections of a company’s financial statements to define its health and attractiveness – since financial statements are standard between companies, this can help compare two potential investments apples-to-apples. To make things easier, you can directly find most of the ratios by clicking on “Key Ratios” in the Quotes Tool. These tables will allow you to see the evolution of the firm in terms of their profitability. This can be useful for you to conclude that your company is profitable over the long-term. You will also have the bird’s eye view of your firm and its competitors in the same industry. By doing this, you might find a competitor that would be a better stock pick or reassure yourself that your stock pick is the best in its category. 1 of 3) If you choose a Passive investing strategy, how will your portfolio look with its first allocation? 2 of 3) What does it mean if a stock is near its Resistance line? 3 of 3) Why do investors use financial statements when conducting fundamental analysis?